Charles P. Major married Mary Lucy Dempsey (1873-1941) on February 3, 1898. His obituary in the Skaneateles Press (December 19, 1952) said he had retired from the New York State Electric and Gas Company of Auburn where he had worked for 40 years. He was active in Auburn politics and in 1929 was a Democratic candidate for city council, but lost. He and Mary Lucy Dempsey Major had three children — Stanley, Margaret and Kathleen. Birth years of the children vary slightly from source to source. Also, the Auburn Citizen (November 27, 1908) noted that Mr. and Mrs. Charles Major lost an infant daughter who was born four weeks earlier. Charles P. Major, 77, of 221 Grant Blvd., Syracuse, a native of Skaneateles Falls, died unexpectedly last Thursday, December 11, 1952, while at the home of his daughter, Mrs. William Mitchell, in Dewitt. He had been a resident of Syracuse for the past 12 years. Formerly with the New York State Electric and Gas Co. of Auburn for 40 years, he retired several years ago. He was a communicant of Blessed Sacrament Church. Syracuse and the Holy Name Society. Surviving are a son. Dr. Stanley Major: two daughters, Mrs. Mitchell, and Mrs. Edward Taylor of Syracuse; two sisters, Mrs. Thomas Heverin of Syracuse and Mrs. Agnes Wickham of Ithaca; three brothers, Thomas and Joseph of Skaneateles Falls, and Michael of Syracuse, and 15 grandchildren. Funeral services were held at 9 a.m. Saturday from the late home 221 Grant Blvd., and at 9:30 a.m. from Blessed Sacrament Church, Syracuse. Burial was in St. Joseph’s Cemetery, Auburn. Stanley J. Major (1902-1968) married Margaret R. Meagher (1902-88). Their wedding was big news in Auburn, NY (story at bottom of this page). Dr. Stanley J. Major, 65, husband of Mrs. Margaret Meagher Major, 221 Grant Boulevard, Syracuse, died yesterday in St. Joseph’s Hospital after several weeks illness. He was a native of Auburn. He graduated from the University of Buffalo School of Dentistry, class of 1927. Dr. Major since that time had maintained a practice in the Eastwood section of Syracuse. He was a member and past president of the Onondaga Dental Society, a member of the fifth district Dental Society and the St. Apollonia Dental Society. Dr. Major was a member of the Onondaga Golf and Country Club and the Syracuse Liederkranz Club. He was a communicant of Blessed Sacrament Church and a trustee. He was a member of the Holy Name Society, the Nocturnal Adoration Society, the Laymen’s Retreat League, and the Men’s Club of St. Mary’s Hospital. Dr. Major is survived by his widow; two daughters, Sister Regina Joseph, OSF, Oswego, and Mrs. Gerald Lovas of Syracuse; two sons, Rev. Charles M. Major, Wadmans Hall Seminary, Ogdensburg, and William J. Major of Syracuse; two sisters, Mrs. Alfred E. Taylor and Mrs. William G. Mitchell; three grandchildren and several nieces and nephews. Services will be at 10:15 a.m. Friday at the family home. A mass of requiem will be offered at 11 a.m. in Blessed Sacrament Church. Burial will be in St. Mary’s Cemetery, Syracuse. Services for Margaret R. Meagher Major, 86, of 303 Westminster Road, DeWitt, who died Saturday at home, will be at 10 a.m. Tuesday in Blessed Sacrament Church, with her son, the Rev. Charles M. Major officiating. Burial will be in St. Mary's Cemetery, DeWitt. She was born in Skaneateles and resided in Syracuse since 1929. She was a communicant of Blessed Sacrament Church in Eastwood, a member of its Legion of Mary, and a member and past president of its Altar and Rosary Society. Mrs. Major also taught religious education in the church. She was a member of the Loretto Geriatric and St. Joseph's Hospital auxiliaries and the International Federation of Catholic Alumni. She was a former member of the Onondaga Golf and Country Club, the Maria Regina College board of directors and the Syracuse Dental Auxiliary. Surviving are two daughters, Mrs. Gerald Lovas of Fayetteville and Barbara A. Major of Syracuse; two sons, the Rev. Charles M. Major of Liverpool and William J. Major of Syracuse; two sisters, Kathryn Cuddy of Syracuse and Wilhemena Stapleton of Auburn; three grandchildren, one great-granddaughter, and several nieces and nephews. Mary Jane (Jean) Major (1930- ) married Gerald Lovas. They lived in Fayetteville, NY. Barbara Major (1932-2002) graduated from Blessed Sacrament School, the Convent School and Nazareth College and earned graduate degrees from Catholic University and Syracuse University. She retired in 2001 after 10 years as an assistant with the L'Arche community. She was a Franciscan sister for 20 years. She was involved with Jail Ministry and Unity Acres. Rev. 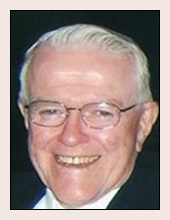 Charles M. Major (1933-2018 ), known to parishioners as Father Charlie, retired as Pastor of St. Joseph the Worker Church in Liverpool, NY, in 2011. His obituary is at the bottom of this page. Andrew McGaan m. Pamela ?? 3. Alfred Taylor and his wife, Kathie, live in Bel Air, Maryland. Daniel Taylor m. Angie ?? Brian Taylor m. Christine ?? Michael Taylor and wife, Maura??? 4. Kathy Taylor m. James Shetler (d. 2007). At the time they were living in Camillus, NY. 5. Charles E. "Papa" Taylor (1943-2009, obituary below) m. Nancy J. Callaway. Charles E. "Papa" Taylor, 66, of Baldwinsville, passed away Thursday at St. Joseph's Hospital with his loving family by his side. He was born in Syracuse, served in the US Coast Guard for four years and moved to Baldwinsville in 1972. He retired from Niagara Mohawk after 34 years. After retiring, he also enjoyed working for Tri-State Auction and the Cleveland Plant and Flower Company. He was a communicant of St. Mary's Church, Baldwinsville and was a member of the Knights of Columbus Council #5083. Papa loved his old cars, tailgates, clambakes, "talks" in the garage and most of all, being surrounded by his family. 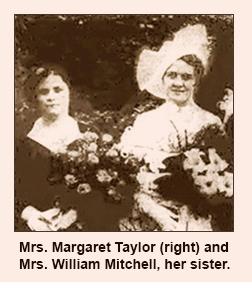 Mary Kathryn "Katie" Taylor, Camillus, NY. 6. Joseph Taylor m. Mary Ann ? ?, Washington, NJ. Andy Taylor m. Stefanie ?? 7. Margaret Taylor (1942-2001) m. Joseph DeGirolamo. 8. Edward Taylor and his wife, Carole ? ?, reside in Camillus. Jeff Taylor m. Patty ?? Donald J. Mitchell (1932-2006) was a graduate of LeMoyne University and a veteran of the Korean War. He was predeceased by his wife, Jean. Mary Mitchell m. Peter Mykytyn. Charles Meagher Major was born in Syracuse on August 30, 1933. He was educated at CBA, Le Moyne College, Syracuse University, and Saint Bernard's Seminary among other opportunities. Ordained as a Diocesan priest in 1959, his assignments included associate pastor at St. John the Evangelist Parish, in Syracuse; biology teacher and athletic director during the beginning years of Bishop Ludden High School; faculty and dean of discipline at Wadhams Hall Seminary, Ogdensburg; The Diocesan Director of Vocations'; co-founder of Aquinas Seminary at Lemoyne College. From 1977 to his retirement in 2011, he was Pastor of his beloved community, St. Joseph the Worker Parish, Liverpool. (Rev.) Charles M. Major, having successfully completed his allotted time on spaceship earth, has gone on to more profound realms. His accomplishments were modest, his enthusiasms were varied, his devotion as a pastor was warm, profound and personal; his mistakes were many, his offenses were garden variety-not an original sinner but practiced in imperfection. Charlie was devoted as friend, resourceful as companion, restless and inquisitive as student/learner. There was always more to do than time to do it. Gratitude loomed large in his spirit and expectancy marked his attitude. He relied on others in hosts of different ways and in a variety of circumstances. Remember him as a cheerleader, ever so appreciative of what has been and open to what will be. Charlie's death — on September 5 — was caused by an undetermined neurological event that his body could not heal. As a man of faith in medical science and in spirit, he donated his body to SUNY Upstate Medical University. He was predeceased by parents, Dr. Stanley J. Major and Margaret Regina Major; by his siblings, Barbara and Bill Major and Jean Major Lovas. His family includes numerous cousins, especially Bill Cuddy (Pat Hoffmann); niece, Mary Barbara Lovas, (John Sharon), great-niece and nephews, Rory, Rebecca, and Brendan Sharon, many friends, especially Ellen McDonald, Jack Heagerty, Chuck Fahey, Jane Hugo, Ellen Golden and Jack Sipple. Celebrations of Charlie's life will be held at St. Joseph the Worker Church, 1001 Tulip Street, Liverpool. Calling hours will be Friday, September 14 from 3-7 p.m. with a Vigil for a Deceased Priest to follow at 7:00 p.m., led by Msgr. Charles Fahey. Liturgy will be held on Saturday, September 15, at 11:00 a.m. Led by Bishop Thomas Costello, Fr. Peter Major (Charlie's cousin), Msgr. John Heagerty, Dc. Steve Manzene. All other brother priests, vested or not, are welcome to sit among the people of the God. In lieu of flowers, donations may be made to Jail Ministry, 259 East Onondaga St., Syracuse 13202, Food Pantries at St. Lucy Parish, 432 Gifford St., Syracuse 13204 or St. Joseph the Worker Parish, 1001 Tulip St., Liverpool, 13088 or The Maryknoll Sisters, PO Box 311, Maryknoll, NY 10545. One of the most brilliant and largely attended weddings in Auburn in years was that of the Misses Margaret Regina and Rosamond Bennett Meagher, daughters of Mr. and Mrs. William H. Meagher of 158 State Street, which took place at half past nine o’clock this morning at the Holy Family Church in North Street. In a double ceremony witnessed by an assemblage which exhausted all seating space in the edifice, Miss Margaret became the bride of Dr. Stanley Joseph Major of Eastwood, son of Mr. and Mrs. Charles P. Major of 43 Bradford Street, this city, and Miss Rosamond was joined in wedlock to Dr. J. Edward Kelly of Syracuse, son of Mr. and Mrs. John T. Kelly of 973 Lancaster Avenue, Syracuse. The ceremony was performed by Rev. Emmett Magee, assistant pastor of Corpus Christi Church, Rochester, and a cousin of the brides. Assisting him were Rev. John A. Conway, pastor of the Holy Family Church, and Rev. Andrew G. Dissett of Lyons, a former assistant pastor of the church in which the double marriage was solemnized. Immediately following the marriage service Father Magee celebrated a solemn high nuptial mass. In this he was aided by Father Conway as deacon and Father Dissett as sub-deacon. The Misses Katherine Marie and Mary Helen Meagher, sisters of the brides, were maids of honor. Miss Wilhelmina Eileen Meagher, their youngest sister, served as bridesmaid. Little Miss Katherine Clark was flower girl. With her, as page, was Donald Donnelly a cousin of the brides. F. Howard Maywatt of Auburn and New York City, a close friend, was Doctor Major’s best man. Walter Kelly of Syracuse, a brother, served in a like capacity for Doctor Kelly. The ushers were Lucius Foote of Syracuse, Raymond Kelley of Niagara Falls, Harold Dwinelle of Auburn and Jamestown and Edward Donohue of Auburn. A gathering, which perhaps was the largest ever to attend a wedding here, had taken places in the church long before the hour for the ceremony. By the time for the service guests had filled every seat and were standing in the side aisles, vestibule and every other point of vantage in the church. A color combination of pink and white had been carried out effectively at the church. The marble altar had been adorned profusely with pink and white gladioli, and golden candelabra held lighted tapers. The sanctuary had been filled with palms, ferns and huge baskets of pink and white gladioli and roses, the predominating flowers in the decorative scheme. The music, one of the outstanding features of the nuptials, was under the direction of James A. Hennessy, director of music of the church. Miss Kathleen Plunkett, church organist, presided at the organ. For half an hour before the service, while the guests were assembling, she played Wagner’s Pilgrims’ Chorus, Handel’s Largo, Schumann’s Traumerei and Geibel’s Shepherd’s Idyl. Weigand’s Kyrie mass was sung by a quartet composed of Mrs. Louis H. Boulter, soprano; Miss Annabelle Doyle, contralto; William O. Gilboy, tenor; James A. Hennessy, bass. The Offertory and Ave Maria were rendered vocally by James Jay Fay, Jr., of Syracuse, a pupil of Martini. Gaunod’s Sanctus Benedictus was sung by Mr. Gilboy. Panis Angelicus, by Franck, was sung by Mr. Fay, after which Bizet’s Agnus Dei was given by Mrs. Boulter. The brides entered with their father. Each was attractively gowned in bridal satin. The gowns had shoulder trains and mitten sleeves and the train veils were covered with tiny orange blossoms. Their caps, with chin straps, were of rose-point lace. Their veils were of tulle, caught with orange blossoms. Each wore slippers of crepe de chine, covered with tulle and orange blossoms. A sheath of calla lilies was carried by each. The maids of honor and bridesmaid were attired in gowns of eggshell satin, of Patou design. Each wore a French felt picture hat and crepe de chine slippers. Miss Katherine Meagher’s hat and slippers were of orchid color. Miss Mary Meagher wore a hat and slippers of Bonnie blue shade. The hat and slippers worn by Miss Wilhelmina Meagher were of deep rose hue. Each carried roses. At the conclusion of the mass, a wedding breakfast was served at Springside Inn on Owasco Lake to members of the immediate families and the clergymen. This was followed at 12:30 p.m. by a reception at which there were 125 guests. A stringed orchestra provided music. Last evening, at the inn, Mrs. Meagher, mother of the brides, gave a bridal dinner. A color scheme of pink and blue had been effected for the reception this afternoon. Numerous pre-nuptial events, including luncheons, teas, dinners and showers, occupied the brides. Among those who entertained for them were the Misses Juliette Hanlon, Mary Carr, Lillian and Loretta Donahue, Edith Murray, Daisy Bell, Ellen Casey, Marie Murphy, Anne and Margaret McMahon, Mrs. Arthur Meeker, Mrs. Charles Sullivan, Mrs. Thomas Tellman, Mrs. Frederick Wilson, Mrs. Charles Major, Mrs. George [name obscured] and Miss Margaret Meagher’s bridge club, which gave a dinner at Krebs, Skaneateles. Both brides are among Auburn’s best known young women and each is a talented and accomplished musician. Mrs. Stanley J. Major was graduated from the College of New Rochelle in 1922 and from Auburn High School in 1918. At college she was vice president of her class, chairman of the Junior Week Committee, manager of the senior class basketball team, captain of the varsity basketball team in her senior year, and a member of Alpha Alpha, honorary philosophical society. For two years following her graduation she was a member of the faculty of the Chateaugay, N.Y., High School. For the past three years, until June, she had been a teacher of English in Auburn High School. Mrs. J. Edward Kelly was graduated from the College of New Rochelle in the class of 1928 and from Auburn High School in 1924. She was president of the college student body in her senior year and was president of her class in its freshman, sophomore and junior years. Doctor Major is a graduate of the Dental School of the University of Buffalo in the class of 1927 and of Auburn High School in the class of 1921. He was captain of the High School football team in 1920. He was affiliated with Delta Sigma Delta fraternity at college. He is practicing dentistry in Eastwood. Doctor Kelly was graduated from the College of Medicine, Syracuse University, in 1927. His preparatory schools were the Travers School and Christian Brothers Academy, Syracuse. His college fraternities were Phi Kappa Psi, social, and Nu Sigma Nu, medical. He is pursuing his profession in Syracuse. Dr. and Mrs. Major will reside in Forest Hill Drive, Eastwood. Dr. and Mrs. Kelly will make their home at 132 East Borden Avenue, Syracuse. Their wedding trip will take them to Washington, D.C., via New York. For her going-away outfit, Mrs. Major wore an ensemble of Bonnie blue ostrella trimmed with gray Lepan fur. She wore a blue hat and blue suede oxfords. She carried a blue bag. Mrs. Kelly’s going-away costume was an ensemble of Hunter green broadcloth. Her hat was of the same shade and her oxford were of green suede. Her bag was of the same color. Tomorrow morning will see one of the most eminent golfers in the city of Syracuse join a twosome for life. In other words, Bill Mitchell, handsome “pro” at the Onondaga Golf and Country Club, is getting married. Read it and weep, fair lady golfers! Imagine the slump in the number of feminine golf pupils. The blonde, brawny and bronzed golfer has chosen as his bride Miss Kathleen R. Major, daughter of Mr. and Mrs. Charles Major of 43 Bradford Street, Auburn. The wedding will take place at 9:30 o’clock tomorrow morning in St. Mary’s Church, Auburn, with Rev. J. F. McGrath officiating. Miss Margaret Major, sister of the bride, will be maid of honor, and Robert Mitchell of Rochester, brother of the groom, will be best man. After the wedding the couple will take a motor trip, the destination of which they refuse to divulge. On all queries regarding it, they’re as communicative as the Sphinx. All they admit is that they will be back in town before long and take up their residence here. Mitchell is the son of Mr. and Mrs. J. F. Mitchell of 274 Brooks Avenue, Rochester. He has spent the past three years here in Syracuse and is one of the most popular golfers in the city, to say nothing of being the best. He has won the city open championship for two years running. Now he has entered the marital ranks and thereby changes his title from champion bachelor golfer to champion benedict golfer. Mrs. Taylor was married last Thursday at St. Mary's Church in Auburn by Rev. Dr. William E. Cowen, pastor. She was Miss Margaret Paul Major, daughter of Mr. and Mrs. Charles P. Major, 43 Bradford Street, Auburn. Mr. Taylor is a son of Mr. and Mrs. Alfred J. Taylor, 423 Bryant Avenue, Syracuse. Mrs. William Mitchell of Syracuse, sister of the bride, and Edward Walters were the attendants. Mr. Taylor and his bride will make their home in this city at 423 Bryant Avenue.